Government of India is all set to Give birthday gift to Former prime minister Atal Bihari Vajpayee as recognizing him with biggest award Bharat Ratna on 25th December (birth date of Atal Bihari Vajpayee). Our former Prime Minister Atal Bihari Vajpayee ji to be given the “Bharat Ratna” award! Recently, the Bhartiya Janta Party (BJP) and Shiv Sena leaders called for awarding the “Bharat Ratna” to Atal Bihari Vajpayee. The Veteran BJP leader murli manohar joshi said that “No one deserves Bharat Ratna than Vajpayee ji. The Shiv Sena leader anant geete said that his party wants Bharat Ratna to be awarded to the former Prime Minister. “Atalji must get a Bharat Ratna. The Shiv Sena wants that bharat ratna should be awarded to Atalji,” he said. 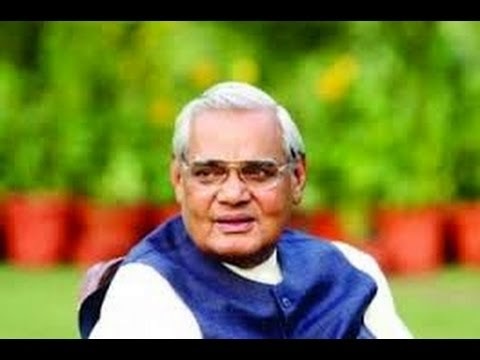 Atal Bihari Vajpayee has given his best to the country and it is now his turn to be awarded with “Bharat Ratna.” moreover, when the UPA government had declared the Bharat Ratna award for former cricketer “Sachin Tendulkar” and scientist “CNR rao”, the BJP condemned the congress for avoiding Vajpayeeji’s contribution to the nation. It would be a proud moment for BJP leaders and for all of us that Atal Bihari Vajpayee ji will be awarded with the Bharat Ratna. Atal Bihari Vajpayee ji was eleventh Prime Minister of India from the year 1998 to 2004. He has done so much great work for our nation. The recommendation for bharat ratna is made by the prime minister himself to the president. Moreover, the date is not decided yet for awarding the Bharat Ratna for Atal Bihari Vajpayee. The government’s rule for Bharat Ratna is clear that the number of annual awards is limited to a maximum number of three in a year. Furthermore, the former Prime Minister Atal Bihari Vajpayeeji’s birthday on 25th December will be celebrated as a “Good Governance Day” this year. Our Prime Minister Narendra Modi has announced this recently. 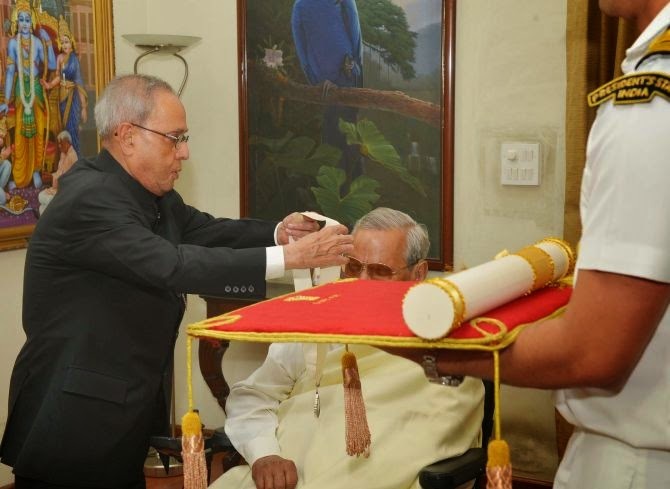 Update :- President Pranab Mukharjee Personally Awarded Bharat Ratna to Former Prime Minister Atal Bihari Vajpayee at his home in delhi on 27th March, 2015 in presence of Narendra Modi, Advani ji, Rajnath Singh, RSS Chief Mohan Bhagwat.